No, this isn't another sappy post about Mr. Kilt (although I could write at least another 20). Today when I got home from Mannheim, I headed over to the bike shop to pick up my new bike. After all the cycling tours last summer on my trusty Dutch bike, I decided I really wanted something that could handle trails and the hills in the countryside better. Last weekend, I headed over to the Trek store in Munich, told the boys what I was looking for and took a few test runs. 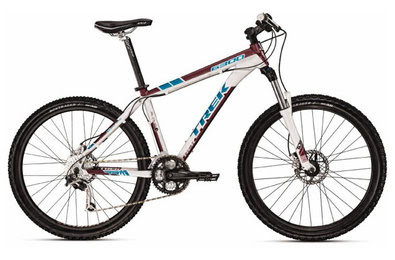 I quickly fell in love with a mountain bike and after the agreement on a discount and free switch of the tires, I had bought my second bike. Mr. Kilt met me at the bike shop for the pick up and we had it fitted with lights and bought a lock and then I rode around the parking lot for half an hour to, erm, make sure everything was working okay. Alright, I actually just wanted to play. Hee hee. If the weather holds up, the first Sunday cycling tour is planned for this weekend with about 15 people signed up. Only a big loop around Munich but I am looking forward to giving the bike (and my legs) a longer work out and catching up with the cycling gang after the long winter. I also have some company this weekend. An American friend of mine who lives in Brussels is flying in tomorrow and spending Saturday and Sunday with me. I have a fun weekend planned for her but mostly looking forward to catching up and girl time. Looks wonderful! have a great weekend. Congrats on the bike, looks so incredible!!! Eye candy!!! And the friend, i hope you get some good pics. Thanks for the reminder that biking season is near. We need to get ours out and used too! I know the feeling :) I was just as excited when I bought mine last summer. I still love it and ride to work when ever the weather permits. Have a great "girls' weekend"! I've been meaning to replace my old bike (20 years) for a while now, but it's not gonna happen this year due to my USA trip.